10: Changes to St Swithun’s church in the 1870s. 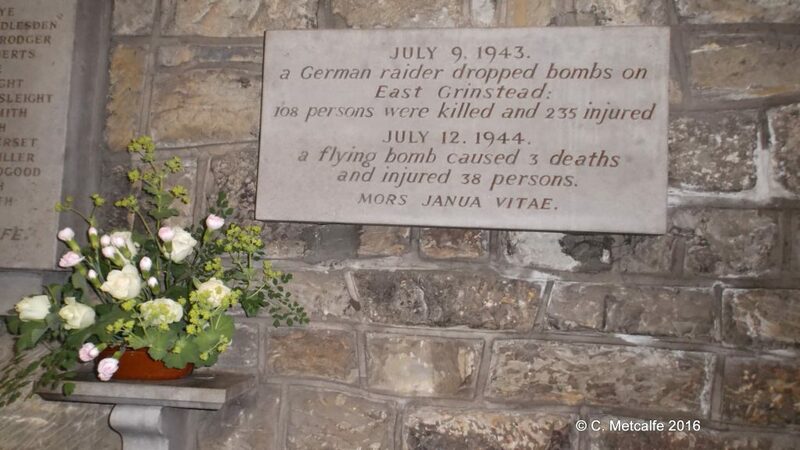 This tablet, mounted on the south wall of St Swithun’s church, commemorates the victims of enemy action, on July 9th, 1943, when a German raider dropped bombs on East Grinstead. 108 persons were killed and 235 were injured. 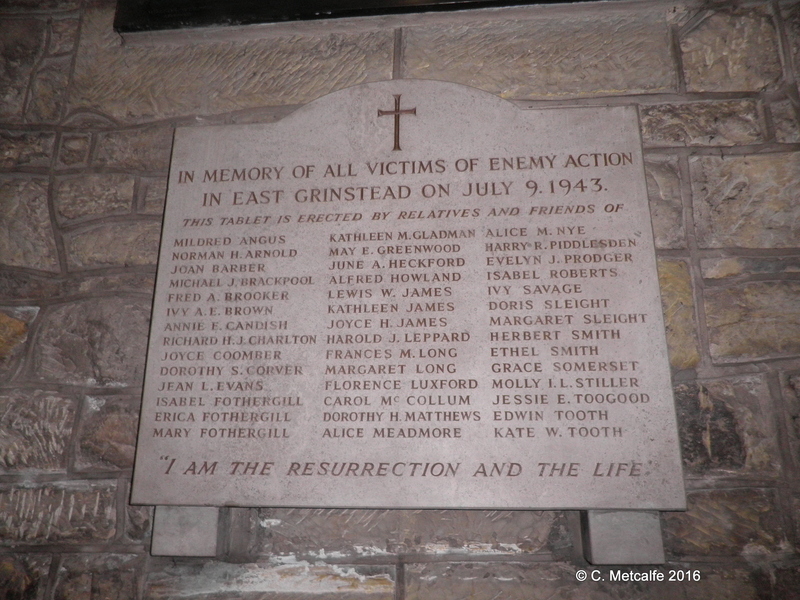 The list is of the names of victims who worshipped regularly at St Swithun’s. There is a fuller list at East Court, in the War Memorial Garden. There is also a memorial on the site of the former Whitehall cinema. Some of those killed are buried in a mass grave at Mount Noddy; others were buried privately. The reason behind the attacks is not clear. Possibly a site in or near the town was mistaken for a military objective, but there are records of the deliberate strafing of civilians in Railway Approach.This must surely have been the worst civilian loss of life in the south east of England during the War. Those killed included children at the cinema, adults and service personnel. The bombs fell just after 5pm, so many of the town’s children were home from school and went to the cinema on that fateful day. The East Grinstead Community Play, ‘Matters of Chance’, in 2010, re-enacted scenes from this day and its aftermath in an excellent and very poignant production. In St Swithun’s, there are always fresh flowers by this tablet, and the victims are honoured every year on the anniversary in a special ceremony in East Court War Memorial Garden.